I FINALLY tried one of those acai bowls that I saw popping up all over fitness articles and Instagram (apparently a popular breakfast choice for fashion bloggers). I headed over to Juice Generation, which was the place that fueled my luxury $8 peanut butter blueberry smoothie habit. At those prices, my trips to Juice Generation lasted a week. After scanning the menu, I was torn between the PB Acai Bowl and the Aloha Acai Bowl. The PB includes acai, banana, omega-3 peanut butter, strawberries, cacao nibs (tiny chocolate chunks), almond milk, and hemp granola. The Aloha ingredients are acai, banana, almond milk, strawberries, pineapple, bee pollen, and hemp granola. I went with the PB Acai Bowl, and OHHH YEAAAH, was it good! And really cute. I couldn’t really identify the taste of the acai…the pudding/yogurt-like concoction took on the creamy flavor of peanut butter. Then you have the fruits and hints of chocolate from the cacao nibs. The granola also gave it a fun crunchy texture. Taking into account how delicious an acai bowl is, I wasn’t surprised that you should be mindful of how often you eat it. 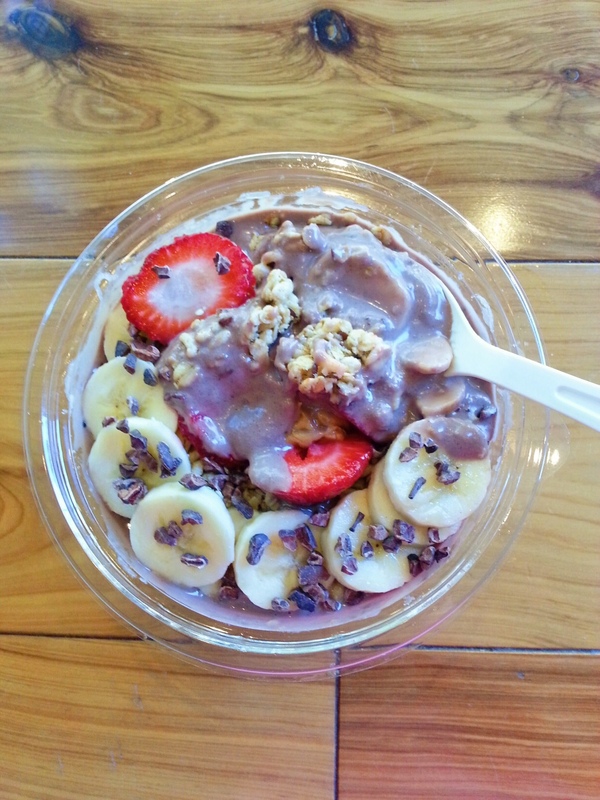 An acai bowl can get up there in sugar and calories. At least 1) it is massively filling 2) it’s still a SUPER treat. Because acai is a super food. It contains fiber, potassium, calcium, proteins, phosphorus, vitamins C, E, B1, B2, B3, fatty acids Omega 3, Omega 9, and Omega 6. Acai has been called “nature’s own multi-vitamin”. It’s also known to be high in anti-oxidants, which helps get rid of free radical damage in the body. With all the nutritious benefits and the energy boost, no wonder people are choosing to start their day off with an acai bowl. I was excited when I saw that Juice Generation shared their recipe for the PB Acai Bowl and the Aloha Acai Bowl with Glamour here. It’s a pretty simple set of instructions for the PB Acai Bowl. I bought the acai berries and granola at The Amish Market in New York City. I found this brand of frozen acai berries and another (in pic below). I had tried Whole Foods the night before, but they didn’t have any acai! I couldn’t find cacao nibs. I should have just shaved chocolate or broken up pieces into the bowl. Also, I would have added strawberries to this recipe. Use two packs for your acai bowl. It was like cutting ice pops. The instructions on the package said to run it under water for 5 seconds and then open it up. I think because I was lugging it around in extreme heat, I actually should have let the packs freeze a bit. Because it was kind of slushy. You will see why this is bad later. One half of the banana for blending. 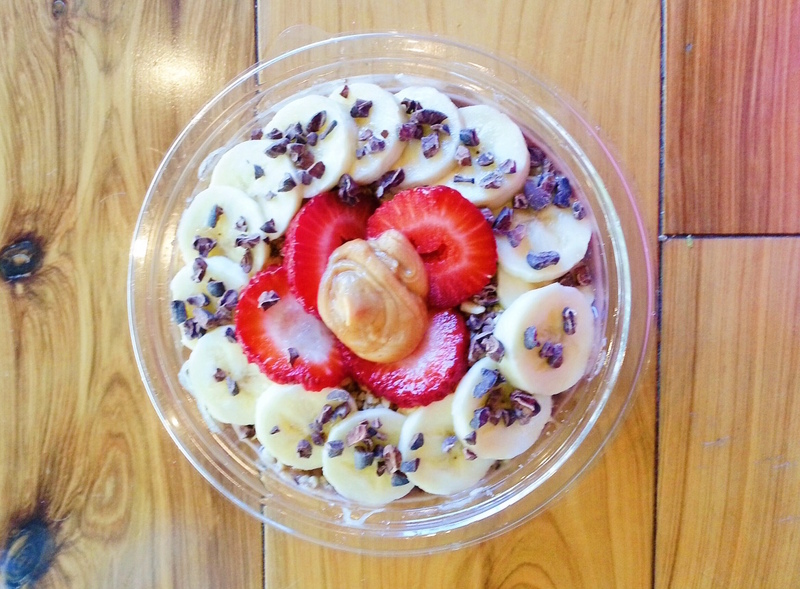 The other for decorating and topping your acai bowl. It was too thin. No lovely pudding-like texture here. I should have refrozen those acai berry packs! I ended up adding 9 ice cubes to the blender to get the mixture thicker. Throw the mix into a bowl and add your pretty slices of banana. Sprinkle in some hemp granola. I was disappointed that they weren’t clusters. They were just flakes/pieces. I don’t know why I had in my head that they were going to be adorable clusters. Probably from a childhood cereal. And a dollop (two teaspoons of peanut butter) on top and….Ta-Da!! It was still a little soupy, but it was damn tasty! When I ate it this time, it reminded me of red bean. 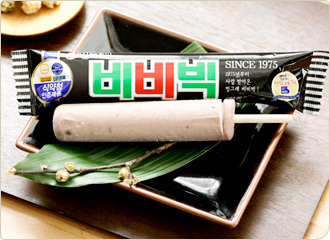 Like the Korean red bean popsicles from my childhood. Yeah, I remember thinking how phallic it looked even as a kid. The Juice Generation acai bowl in NYC comes out to about $12 after taxes. I guess you’ll save a bit if you make them at home. The acai berry packs I bought are $8.99 for four, and you usually need two packs per serving. You can do the math. Anyway, you should definitely add strawberries, blueberries…there are so many recipes out there! This took me 5 minutes to make. Despite getting acai berry slush all over myself, I deem the level of difficulty to be a big, fat ZERO. Written by: Erica Cho on August 18, 2015.